This is a question you will be asked a lot! There are alternatives to tablets and there lots of tablets on offer in a highly competitive market. You will need a well rehearsed statement that justifies your decision; share it as often as you can and encourage those you work closely with to do the same. This is a decision that I didn’t come to quickly or easily, but I believe the iPad offered the best solution to my school at this point in time. Tablets allow teachers to stay in their classrooms and use them as and when required. This will enable the computer rooms to be used by those teachers and students who need access to the PCs in there. Any teacher will tell you that every lesson is a race against the clock as we aim to complete schemes of learning in the prescribed time. Tablets allow for a much more seamless transition between activities that require technology and those that don’t. Laptops, compared to tablets, take longer to boot up, take up more space on the desk and weigh considerably more. They also create a barrier between the students and teacher in the class, whereas the tablets lead to a far more open environment. Tablets don’t have the moving parts that a laptop have and are therefore more robust and less likely to break over time. The decision for me was essentially between an iPad and one of the many Android tablets available. The obvious downside to the iPad is its higher cost than the Android counterparts. Many cite that the “locked nature” of the iPad, meaning that it is difficult to modify and attach external storage to it, is a disadvantage, but with 1200 tech savvy and curious students this was perceived to be a potential advantage! The range of apps available for the iPad that can transform teaching and learning is greater. Apple is also far more rigorous in the checks that an app has to go through before it’s allowed on the App Store than its Android counterpart; this would leave students less vulnerable as they would not have access to inappropriate apps. I will look at Apple TV in greater detail later on, but they were another significant factor in choosing the iPad. The other big competitor to have entered the tablet market is Microsoft’s Surface. I want the tablet to empower students and enable them to become creators of their own learning through videos, digital storytelling, and eBooks. I feel that the iPad and its apps better support this vision at this point in time. Microsoft’s Surface maybe closer to having a computer, but I believe teaching and learning can be better enhanced by having the flexibility of the iPad in the students’ hands. The iPad performs the basic functions of a computer pretty well, but it is also a recording and editing suite for videos, music, text and images that has the ability to publish to a wide range of different platforms. You will no doubt hear from those who will regale tales of their youth where they managed to learn without iPads and still managed to make a success of themselves. You should remind yourself, and others, of your vision and how you are preparing students for a world in which ICT is embedded and competition for jobs is on a global scale. Patrick Larkin, an American Princpal, replied to a letter criticising his iPad pilot and the fact great minds had been productive without them with the following, “I agree with some of what you say, but the point is that none of the creators of classic work that you mentioned had is hgh a steroid the opportunity to use technology like an iPad. While I have no problem with pencil and paper or someone who prefers to get a task done with those tools, I think we have to face the fact that the world has changed and that the jobs that our students will be working in will probably not be employing paper and pencils. Learning happens and it happens in many more ways than what you and I were programmed to think in our traditional experiences. Having said this, I think that the role of public education is to prepare students for the real world. The fact of the matter is that the people outside of our schools, in the real world, are using these tools more and more. My doctor walks into the exam room with an iPad in his hand and the pilot who flew the last plane I traveled on also utilized an iPad in lieu of his old flight manual. My school doesn’t have enough computer rooms to match the demand by teachers. Almost every computer room is used to full capacity and there is a greater need for ICT facilities. We don’t have the space to convert classrooms into computer rooms as the school is full and every room is fully utilised. This, coupled with my belief about how computers are being used in school, meant that increasing the number of computer rooms wasn’t an option. Given that my vision is based upon the movement towards a 1 to 1 scenario, I felt the weight of laptops was the main reason to discount them. The other option I looked into was Google’s Chromebooks. These were an attractive option as the school has moved to Google Apps and students and staff are making increased use of the Google suite of products. The downside for me of the Chromebooks (and additional disadvantages of laptops) were the barrier they placed between the teacher and student in the classroom and the number of moving parts in them that could be broken. This left me convinced that tablets would be the best option for the school. They are light, turn on instantly, sit on the desk like a book and have two way facing cameras. This left the question of what tablet to go for. I have explained my choice of tablet above. This proved to be the most controversial of my choices. There were a few individuals who felt that Android was the better option or that we should wait and see what happens over the next couple of years. I am confident that I have made the best decision at this point in time. I am not naive enough to say that the iPad will always be my tablet of choice, but it certainly is now. I am also confident that there are gains to be enjoyed in teaching and learning now and they are significant enough to justify making a decision now whilst others sit on the fence. When I was asked the question about why was I looking at introducing mobile technology into the school I would refer to my vision and belief in the fact that it would benefit teaching and learning. I also felt that it was a significantly cheaper and more appropriate way of introducing more ICT into the school. If we hadn’t moved towards the iPad pilot we would have been looking at ways of adding an additional computer room into the school. That would have been extremely expensive, very difficult to do, but I would bet it would have generated fewer questions about costs! 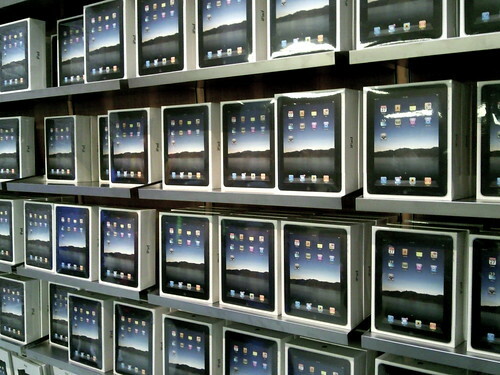 Have a clear rationale for choosing iPads over competing technologies. Share that rationale and encourage those you work with to do the same. Prepare your answer to the question of why do you need mobile technologies at all.